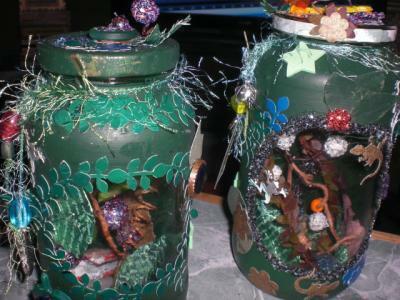 Create these lovely story jars by adding thematic decorations to recycled food jars. You can use fabric, glow in the dark stars, and more. 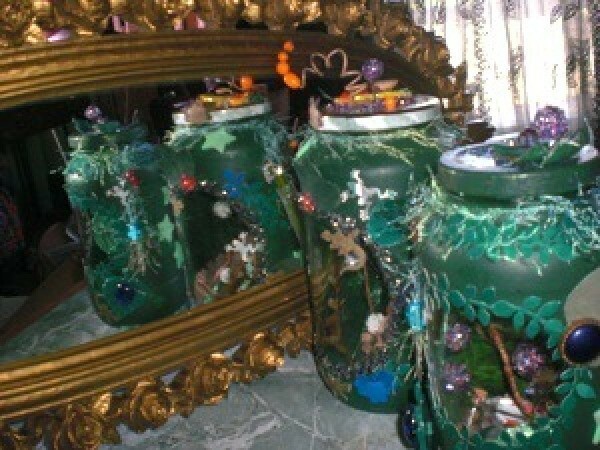 This is a guide about making a decorative story jar. 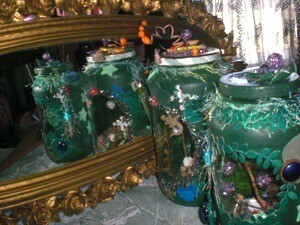 Story Jar made from recycled kitchen jars. After the contents of the jar are emptied, wash and dry. If you want a "peep hole" in the front, cut peel-n-stick shelf paper the desired shape and place it where you want it, then paint the jar. Find things that are similar to put inside and out. Mine have a variety of items both new, as well as used, but are thematic. leaves cut from old green clothing and also from a green canvas tent! This craft is a lot of fun and would make a great gift! Source: Saw the idea on a website. If you don't have peel-n-stick paper you can make a free hand peephole without a pattern, just so you can peep into it. Here's a link to my crafts blog that I update when I can. It is a very easy site to use & you can also upgrade your account for more options! Please feel free to comment any of my pages. meoowmom : I agree that these would make wonderful gifts.I'm sure that used as a "memory jar" they will always have a special place with both giver & reciever! Gingembre : I agree about the wide mouth jars.As you might recognize my 2 jars were spaghetti sauce jars & the mouths somewhat small. Tongs (or knitting needles or chopsticks) could be used to lower items in to sit them in glue.I used glitter glue + a little loose glitter but after bumping the jar about & rolling it over a few times it was a mess. I wasn't thinking to let the glue dry overnight as I should have to secure the items. I was having way too much fun being a GIRL with this craft to use better judgment to wait til it was dry! You reminded me of it being a good group project.I was both a Brownie & a Girl Scout & those things will stay with me throughout life of course. It will be fun when I catch up on my redecorating & get my bedroom situated & have shelves to peek into my jars daily to "see whats happening" in the little world behind the glass! Yes I love personalizing my home. If I can't do that (which was the case at a few houses I lived in) I don't feel at home.It seems a little cold.All you can do to make space your own helps with attitude about it.It could be in one of the crumbiest places on Earth but if you can hang your heart there - it's home. Thanks for reading my blog! That makes me very happy to know that it isn't in vein for me to bother with! I'm glad you both enjoyed it ! Maybe when you get yours made you will post a pic with this post to share!I am a curious person when it comes to mini's ! I'm uploading a pic of my latest jar - as you can see I used a piece of country cottage (from dollar gen store) with a little of the picket fence,as well as rose arbor visible as a background paper. I'll upload the other new pics to my blog ,so make sure you check it out! A very interesting, creative craft, one that could easily be enjoyed by people of any age. I'm thinking that the large clear plastic jars (such as the ones peanut butter come in) would also work well for story jars. There would be no worry of getting injured if they break and the jar mouths are wide, allowing larger items to be inserted. I am going to set aside the next large plastic peanut butter jar we empty (my husband eats a lot of peanut butter!) and collect items for a story in it until it is ready to be assembled/decorated. This would be a great project for children to do, either individually or in a group, especially if they are given ample time to collect the items they wish to tell a story with. Knowing that the giver carefully chose all the elements of the story should make the recipient treasure it even more than if it were quickly assembled with little or no thought or effort. I checked out your crafts blog and am intrigued by the personal touches you add throughout your house. Lovely idea. 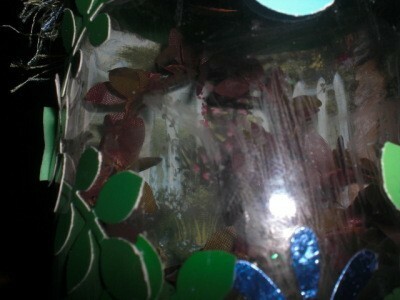 I think I will make some memory jars with things that remind me of my mom and give to my sisters as well for Christmas. Thank you for the inspiration.